The Alumni Board is comprised of over 50 members representing various class years, majors, backgrounds, professions, and geographic areas, and residing throughout Florida and other states. Alumni Association Directors are elected for a three-year term. See which board member is in your district! Meetings are held two times each year--in the fall, early in the calendar year, and in the spring. Board members are responsible for making their own travel and accommodation arrangements. At this time, the University is unable to offer reimbursements for expenses. However, expenses are considered tax-deductible contributions to the University, so Board members are encouraged to complete and submit a Volunteer Expense Claim Form to receive Gift in Kind credit. A member of the Alumni Board of Directors is selected to hold the position based on his/her commitment to Stetson University and to the goals of the Alumni Association, distinguished personal and/or vocational achievement, and financial support of the university. Other desired qualifications include the ability to motivate individual members and committees; proven leadership in other organizations, associations, or clubs; the ability to set and achieve goals and objectives; ability to work as a team player. Directors will be representative of the diversity of the Alumni Association membership. All persons who have graduated from Stetson University or who have been officially enrolled at the University for a significant period of time are eligible for consideration for the Board of Directors. In accepting a three-year appointment, Alumni Board members agree to fulfill the responsibilities associated with Board membership. Regular attendance at both Board meetings is expected to be a high priority. Missing both meetings in a given year is subject to evaluation. Contribute a financial gift annually to Stetson University. All Alumni Board members will contribute at a level appropriate to their capability as donors. It is important for Board members to set the example for all other alumni by participating financially in the life of the University. 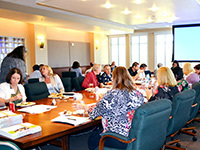 Board members are asked to consider including the University in their estate plans. Attend campus alumni programs when possible, including Homecoming. Assist with planning and implementing alumni programs in one's geographical area. Serve on standing committee(s) of the Alumni Board and actively participate in the functions of the committees. Exercise loyalty toward the Board and confidentiality regarding its internal affairs as discussed at Board meetings. Seek out and encourage talented alumni for volunteer roles such as the Board of Directors or District Committee membership. Assist the staff in identifying individuals for alumni awards. 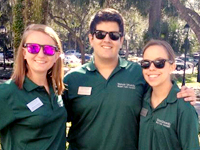 Serve as an ambassador and advocate for Stetson University. Become a representative and spokesperson in the community for Stetson. 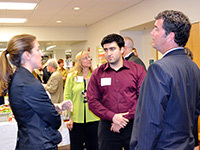 This could involve talking with prospective students, meeting with other alumni, communicating with area legislators, and attending local alumni events. Assist the University and the Office of Alumni and Parent Engagement in identifying and implementing programming that will enhance the student experience at Stetson, thus helping to mold more loyal alumni. Become familiar with the programs and activities sponsored, organized, and coordinated by the Alumni Association and participate in them to the extent possible. Stay abreast of campus news by reading alumni publications and other University materials. Offer ideas to help make the Board of Directors and the Alumni Association more meaningful to the alumni constituency and initiate Board activities and initiatives. Help the Alumni Engagement staff evaluate programs and take initiative in informing them of opportunities for program development and/or funding. Provide sensitivity and support to staff members and other Board members as they perform their duties. As a member of the Alumni Association Board of Directors, you will receive tremendous personal and professional satisfaction by giving of yourself to your alma mater and to fellow alumni. You will be recognized in the Stetson University magazine, on the Stetson University Web site, and through other relevant venues as much as possible. The Alumni Leadership and Development Committee is interested in recruiting alumni who demonstrate leadership qualities for service on the Alumni Board of Directors or in other alumni volunteer roles. The Committee is seeking your help in identifying individuals who you feel would make enthusiastic and contributing Board members. Please encourage such individuals to submit to us a resume, a brief bio, and a statement of intent which explains why they would make good alumni representatives.